Q: Has the Patterson footage recently been proven to be a hoax? For almost 40 years the bigfoot/sasquatch topic has remained near the top of the list of subjects people want to see programs about or read about. Recently, National Geographic Online said an article about recent developments in bigfoot research was the second most read article in 2003, second only to an article about sharks. A subject like this would not remain near the top of the ratings charts for more than 40 years if it was only driven by a 16 second long clip of shakey footage and some campfire stories. Viewers were confused. Many contacted us. They didn't understand how something so obviously false would be stated in a documentary on TV. We explained about tabloid television and the new low standards of the BBc. These folks successfully tricked a lot of people into watching the program by proclaiming to have solved the mystery of the Patterson footage "once and for all." The funding from the BBC was given to Packham and Appleby based on Packham's script, which confidentally proclaims success in recreating the "hoax". The script was written a long time before they actually tried to make a matching costume. Packham and Appleby assured BBC executives they could easily do it. There was no concern about them failing. The script was approved and locked down by the BBC long before it was obvious that even the best Hollywood costume studio couldn't make a matching costume. When the show was delivered to the BBC, the matching costume element couldn't be cut out, because it's the crux of the debunking argument. All Packham and Appleby could do at that stage is try to emphasize other lesser important conjecture, and distort peripheral facts to make some kind of circumstantial case for a hoax. That's Appleby's new lie, to cover up the old lie: They weren't trying to show they could make a matching costume. They only tried to show that they could use the same 'dimensions and the same model of camera and lens. Kiviat's man-in-the-costume is, according to Kiviat, not particularly tall. Kiviat believes the man-in-the-costume would not have to be more than six feet tall. Forensic measurements show the Patterson figure stood about 7'2". The height is only one problem. The hard part is the anatomical proportions and muscle movement. An average sized man would be very hard pressed to fake the same body mass and muscle movement of the figure. It has never been done, even though millions of dollars have been spent to try to debunk the footage in other various ways. Don't buy them and don't watch them unless the promo commercials can show a strikingly similar side-by-side re-enactment of the Patterson footage. That shouldn't be so hard, considering today's advanced state of technology, and the amount of money being sunk into these tabloid shows. 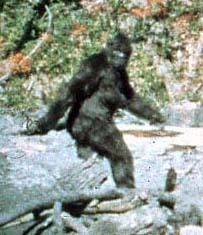 CLEAREST VERSION OF THE PATTERSON FOOTAGE: The clearest copy of the entire, original Patterson Gimlin footage became available to the public in January of 2003. It's a hi-res digital dub of a 1st generation master copy. All previous versions were analog. 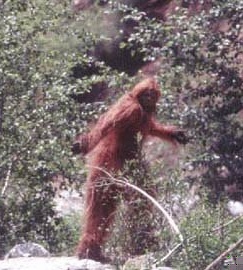 The footage is in the Extras section of the DVD for the 2003 documentary  "Sasquatch: Legend Meets Science". Several prominent researchers, such as Canadian author John Green, know the whole history of the footage  the various scientific examinations, the confessors, the imposters, the rumors, and the media deception, and the unpublicized "debunking debunkings".